100% pure cold pressed & organic Coconut oil ,extracted from the kernel of matured coconuts harvested from Coconut (cocos nucifera). Mooi Naturals Coconut Oil is organic,cold pressed and unrefined, that preserves the vital nutrients. The nourishing oil is of high quality, contains essential fatty acids and anti oxidants.The Vitamin rich natural healing oil helps to lighten dark marks, scars & age spots and reduce their appearance!This oil can be used externally on hair and skin and traditionally and been used as a moisturizer and conditioner. Dry & Damaged Hair Treatment: Apply small amount of oil between your hands then apply it to your hair from roots to ends and comb through. Wrap your hair in a towel for at least 15 minutes/overnight and then follow with a gentle shampoo for a smooth and silky hair! Frizz Tamer :Apply a small amount of coconut oil and rub it into the palms of your hands and smooth it over your frizz to achieve a smooth and shiny look. Face Moisturizer: Applying few drops during day or night , the nourishing oil acts as an excellent moisturiser and an effective primer too to soften the skin before applying makeup. Lip nourisher : Apply it to your lips for a natural chap stick too! 100% pure cold pressed & organic Coconut oil ,extracted from the kernel of matured coconuts harvested from Coconut (cocos nucifera).Mooi Naturals Coconut Oil is organic,cold pressed and unrefined, that preserves the vital nutrients. 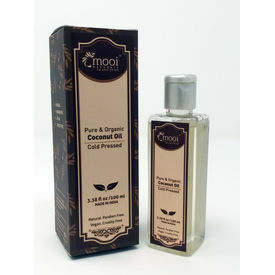 The nourishing oil is of high quality, contains essential fatty acids and anti oxidants.The Vitamin rich natural healing oil helps to lighten dark marks, scars & age spots and reduce their appearance!This oil can be used externally on hair and skin and traditionally and been used as a moisturizer and conditioner.Directions For Use: Dry & Damaged Hair Treatment: Apply small amount of oil between your hands then apply it to your hair from roots to ends and comb through. Wrap your hair in a towel for at least 15 minutes/overnight and then follow with a gentle shampoo for a smooth and silky hair! Frizz Tamer :Apply a small amount of coconut oil and rub it into the palms of your hands and smooth it over your frizz to achieve a smooth and shiny look. Face Moisturizer: Applying few drops during day or night , the nourishing oil acts as an excellent moisturiser and an effective primer too to soften the skin before applying makeup. Lip nourisher : Apply it to your lips for a natural chap stick too!